If you’re looking for a top-of-the-line hidden spy pen camera, then this one from GSmade is a nice choice. There are plenty of cheap ones out there that don’t really work that well. However, the GSmade one is one of the best, and is a top-quality device that most people are really happy with. While it is a bit more expensive than some of the other products, you get what you pay for. In this case, you get a top-quality piece of spy gear that does the job it’s designed to do! Spy pens can be pretty difficult to find in stores. There are often some very cheap ones in toy stores, but if you’re looking for a higher-quality one suitable for adults, you may be out of luck. In our experience, the best place to look is on Amazon. There are a wide range of choices to suit just about any budget. When to Use a Hidden Spy Camera Pen? 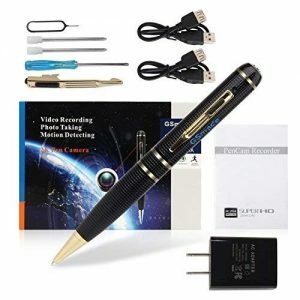 For more details about spy pens, you’ll want to check this out: How do Spy Pen Cameras Work? 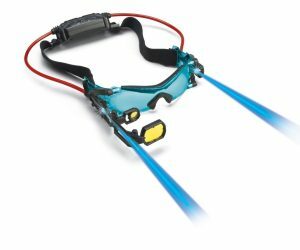 32 GB HD 32 GB, 1080 P Pen, night goggles, etc. This spy camera is very easy to operate, even for children. Here are a few simple steps to get you started. Press the function button until the blue light turns on. When the light turns green, it’s now recording. To stop recording, press the function button once, and the light will turn blue. This means that it’s in standby mode again. Press the function button until you see the blue light. Once it’s in standby mode, press the function button quickly twice, which means the pen is in photo mode. Press the button once to take a photo. Pressing the button quickly twice will put it back into standby mode. Put the pen into standby mode by pressing the button once. You’ll see the blue light. Press the function button 4x quickly. You’ll see the green light flash. It’s now in motion detection mode. You can press the button 4x quickly again to put it back into standby. If you’re looking for a high-quality spy pen with camera, then look no further than this one from GSmade. Among those on the market today, this one is probably one of the best. The video and photo quality are excellent, and the audio quality is good enough. There is a huge 32 GB memory card that comes along with it, and a battery life of 1 hour. This is enough for most people’s needs for a few minutes here and there. In terms of customer ratings and reviews, people seem to generally like this spy pen. Compared to some of the other brands out there, with cheaper spy pens, this one is significantly better. It’s not just a cheap kids toy, but it’s suitable for adults to use in a variety of situations. Sounds like the piece of spy gear you need? You can take a look at all the details for yourself, as well as customer ratings and reviews. 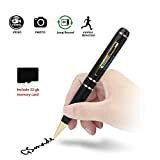 GSmade Spy Pen Camera: Have your Say! Leave a comment below and let us know your thoughts on this hidden spy pen camera. Is it a win? Or, are you considering another brand? p.s. If you’re looking for a device that stays in one place and can record 24/7, then consider one of these: The Best USB Spy Cameras.